Actor Kevin Sorbo once felt as invincible as the man he portrayed on television. Hercules was once the number one television show worldwide, and Sorbo had the title role. Always athletic, he often worked fourteen-hour days, and then put in two hours at the gym. In 1997, Sorbo began to feel numbness and cold sensations in his left arm. He shrugged the sensation off for months. A doctor initially thought that it was likely an ulnar neuropathy, perhaps acquired during one of Sorbo's many fight scenes. Sorbo felt a growing pain in his left shoulder, where an examination by another doctor uncovered a mass. He was scheduled for a biopsy, but before this could occur, a chiropractor did a neck manipulation, and Sorbo's life changed. The lump that had been found in Sorbo's shoulder was an aneurysm: a dilated blood vessel prone to form clots. These clots had been traveling down Sorbo's arm, resulting in numbness, tingling, and pain. After the neck manipulation, clots traveled up into Sorbo's brain as well. At the age of 38, Sorbo had several strokes. Not only has he since recovered, but he has gone on to be a strong advocate for awareness about this common cause of disability and death. 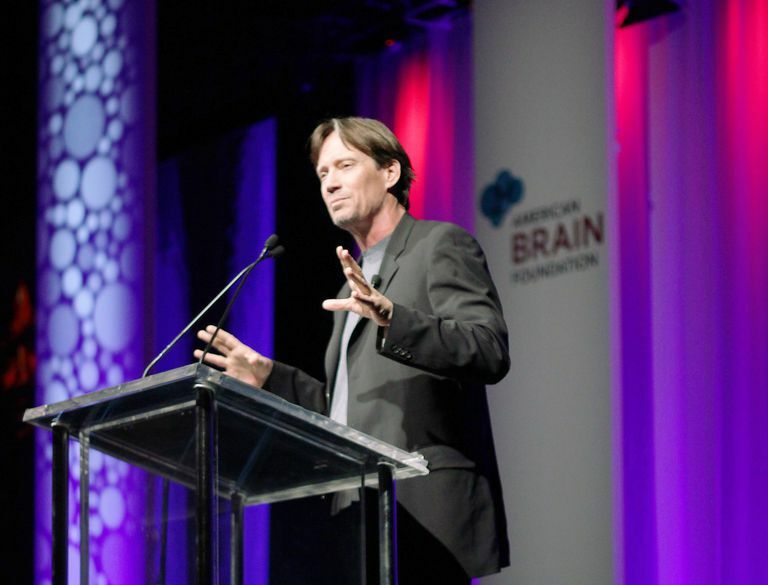 Sorbo was awarded for his efforts at the 2013 Annual Conference of the American Academy of Neurology, where he was kind enough to agree to an interview regarding his ordeal and his recently published memoir, True Strength: My Journey from Hercules to Mere Mortal and How Nearly Dying Saved My Life. AN: Many people have strokes, but not everybody is motivated to speak about it or serve as an advocate as you have been. What is it that drove you to take those additional steps? KS: Two words: my wife. She started bugging me years ago and said, "you have a story to tell. You played Hercules, for heaven's sakes, and you suffered strokes. You're the last guy people would think that could happen to." Initially, I didn't want to do it. I didn't want people to know that weakness that was there. It was tough. It was tough on the ego, it was tough on self-esteem, it was tough on everything. AN: As a doctor, I have to say that your recovery is remarkable. What problems did you have initially? There were four strokes initially. One (blood clot) dissolved before I got to the hospital: that was speech. I looked at my at-the-time fiancee. She just stared at me; I stared at her. I could barely stand up. I was like a drunk. I was hanging on to her, and she dragged me into Cedars-Sinai to the emergency room. Luckily, she'd been a volunteer for two years, so she had some pull. My doctor was very good, too; he got things rolling. I had two (strokes) into my balance center and one into my vision. I still have a ten percent loss of vision in both eyes. AN: As an actor, to have your speech taken right away must have been terrifying. KS: I thought I was going to die that day. There was no doubt in my mind. Universal Studios kept it very quiet. The only thing they let out was that I'd had an aneurysm. AN: How did they take care of the aneurysm itself? KS: The angio. They went through and put in a platinum coil. And at that time, in 1997, that was kind of a newer procedure. AN: Then, as part of the recovery process, you had physical therapy? KS: Four months of learning to walk again. First, it was just sitting in a chair because I couldn't sit up very well. I would throw a ball up and try to catch it. It took me a long time. I would catch like one a day, but would be throwing a hundred up in the air. It was so frustrating. I would sit and realize I would never be the same person. That was the hardest thing. Because I felt like somebody had died. It was me, and I had to find a new person. Trust me, I had a lot of talks with God. There was a lot of blame on everybody else, which we're so typically doing, but as my dad always told me years ago: "Look in the mirror. That's where your problem is." AN: And you've certainly gone on to have many accomplishments since. KS: Well, I finished the last seasons of Hercules, but it was a struggle. I did five years of Andromeda after that, and have done about forty movies. KS: That's why the (book) title is called True Strength. Hercules... that was a phony strength, you know, stunt guys making me look good. I'm a very strong-willed person. I'm a thirteen-year overnight success in Hollywood. I'm used to the frustration. I used to caddy at a country club, and I used to ask all these guys, "how did you become so wealthy?" Every single one of them had the same story: "I failed, and I didn't let it stop me. And I failed again, and I didn't let it stop me." They taught me that failure is a good thing, you learn from failures. Just what my dad taught me, too. Hard work... it's all about hard work. The dizzy spells were horrendous all the time. I had vertigo and was falling backwards 24 hours a day for about a year and a half. AN: And yet here you are. You walked over here without a hint of a problem. KS: If I get really tired, working too hard, not getting sleep, I get that sensation. Like I told my wife, I call it the "stroke feeling." I say "I'm getting that stroke feeling again," and I just need to lie down. AN: You've done a lot of advocacy, including mentioning of the FAST response for stroke awareness. Is that a point of emphasis for you? KS: It really comes down to listening to your body. Don't become a hypochondriac, but you have to listen to your body. I didn't listen to my body. I had three months of warnings in my arm. That aneurysm, which I didn't know existed, was throwing off clots slowly. These fingers became cold, numb. I couldn't figure out what was going on with it... My shoulder was killing me, just killing me. AN: Looking back now, you've learned a lot and done a lot of reading about stroke. What would you have liked to have known at the time? KS: After I had had the strokes? I think the most important thing is, you should tell your patients to have patience. That they have to find their own perspective, and that they have to find their own positive attitude about getting better as well. And you as doctors shouldn't set limitations on your patients, because I had limitations put on me. They said after three to six months, whatever you're feeling, you have to live with the rest of your life. And after six months, I was still doing pretty crappy. And I just said, "you know what, the hell with this. There's no way I'm going to let this thing beat me." I was already pushing myself anyway. I'm the type of guy who if the doctor says only walk a block, I'll walk five blocks if I can. I'll push myself. When I went to a place like this, with a thousand people, the noise was too much for me. I didn't drive for two years, because cars going by...my brain, it overloaded, and I would get dizzy, I would get nauseous, I suffered migraines. All these things happened to me. But I started putting myself into situations like that. I would tell my wife, "look, if I don't...I'm not going to get better. It's no pain, no gain." I had to push myself to get better, and that's what I did. AN: All right. Mr. Sorbo, thank you very much. Mr. Sorbo's book True Strength: My Journey from Hercules to Mere Mortal and How Nearly Dying Saved My Life is now available. For more information, visit his website: True Strength: By Kevin Sorbo.